Editor’s Note: This week, Throwback Thursday looks at two recent issues of unreleased material from one of the greatest lineups ever! Enjoy. For a blues fan, there could not be too many better personnel lineups better than John Mayall’s Bluesbreakers in 1967. For about three months that year, that lineup was Peter Green, who had replaced Eric Clapton on guitar, John McVie on bass, Mick Fleetwood, who had replaced Aynsley Dunbar on drums, with Mayall on vocals, keyboards and harmonica. Tom Huissen, an enterprising fan from Holland had been able to sneak a one channel reel-to-reel into a number of the band’s performances at various venues around London. Flash forward to 2014 when, as Mayall says, “Tom decided he wanted the world to hear these performances and work soon began on restoring the already fine quality on the old reel-to-reel tapes.” So Mayall, along with Eric Corne of Forty Below Records, began to squeeze every drop he could from those tapes. Overall, they did an incredible job! If you are looking for pristine stereo sound, then this is not for you. That being said, the quality of the audio is remarkably good overall. While all the performances here are insanely good, there are standout tracks. Peter Green’s guitar tone is amazing throughout, but on “Have You Ever Loved a Woman” it is downright other-worldly. The band serves up a devastating rendition of the Otis Rush classic, “I Can’t Quit You Baby,” and once again, Green’s tone is from another world. If this cut doesn’t make the hairs on your neck stand up, see a doctor because there is something very wrong. Their version of “Stormy Monday” is elegant, and deep. Mayall’s vocals have an urgency about them, and his keyboarding is inventive and soulful. McVie’s bass lines have just the right amount of deep thumping melody, and Fleetwood’s drumming is punctual, subtle, and in the pocket. Peter Green soars on guitar. Together, these artists bring us blues that transcends and morphs into jazz, rock, and beyond. This music will move you! 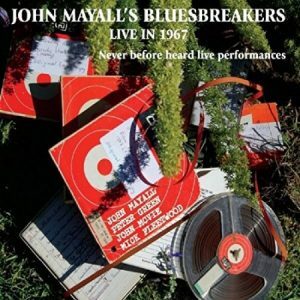 John Mayall’s Bluesbreakers Live in 1967 – Volume Two features 13 more performances from Tom Huissen’s remastered reel-to-reel tapes showcasing this outstanding artist lineup. Three of the tracks here are songs that also appeared on Volume One, but here they are completely different interpretations. Standout performances include “Bye Bye Bird,” with Mayall throwing down on harmonica, the rocking “Please Don’t Tell,” and the rousing “Talk to Your Daughter.” Two exceptional tracks are “Stormy Monday,” and Peter Green’s own, “Greeny.